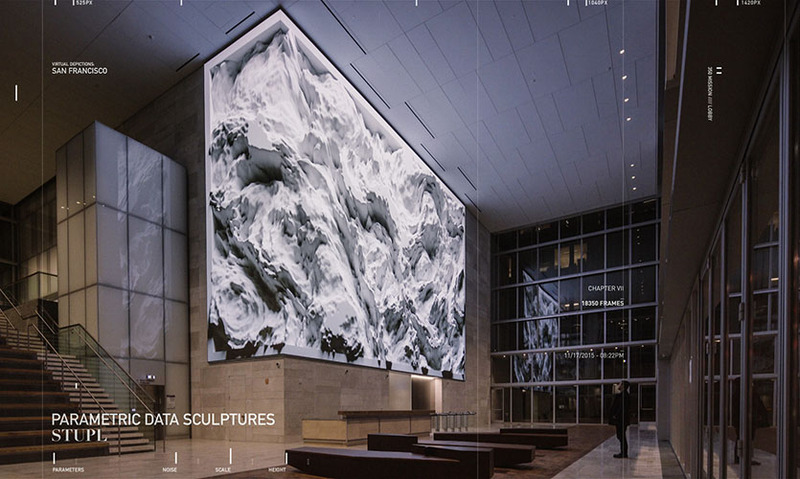 Virtual Depictions:San Francisco is a public art project by media artist Refik Anadol, commissioned for 350 Mission Building in San Francisco. 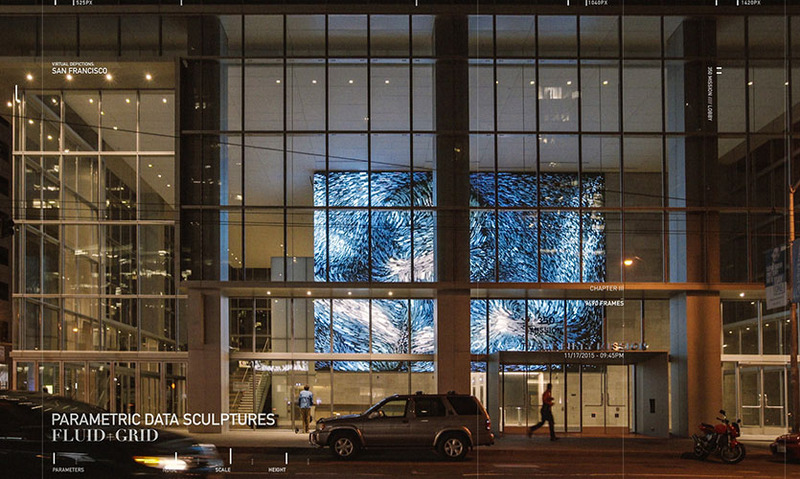 The installation consists of a series of parametric data sculptures that tell the story of the city and people around it within a unique artistic approach to the building’s architecturally integrated media wall. 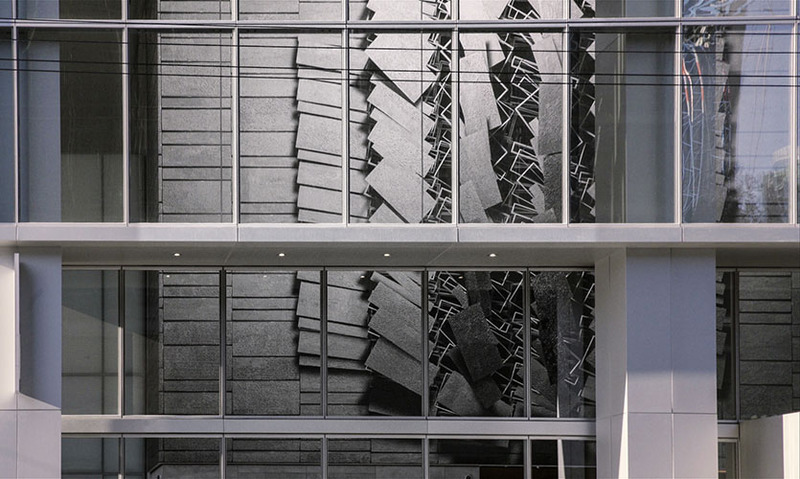 Virtual Depictions:San Francisco was conceived to bring a 21st century approach to public art and define the new poetics of space through media arts and architecture. 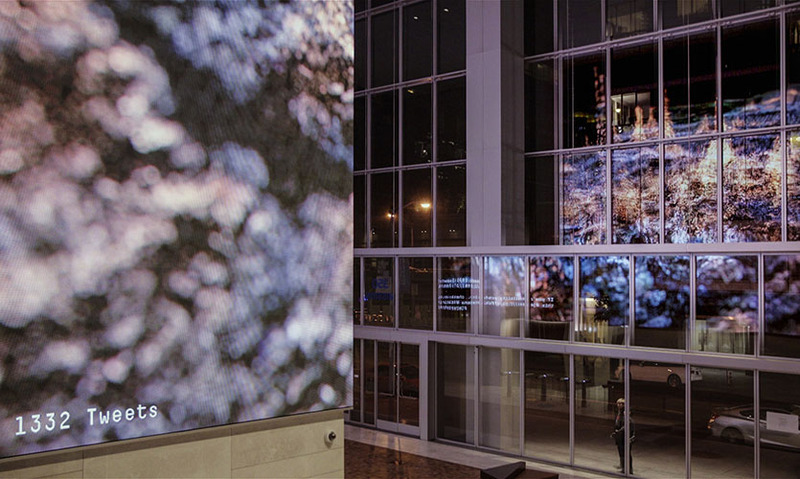 Through architectural transformations of the media wall located in the lobby of 350 Mission (home of Salesforce), Anadol’s installation sought to frame an abstract, cinematic site-specific, data-driven narration. The media wall turns into a spectacular public event, engaging and activating the building’s interior and exterior spaces. “The project also contributes to the contemporary discourse of public art by proposing a hybrid blend of media arts and architecture in the 21st century,” notes Anadol. Anadol’s goal was to make the invisible visible by embedding media arts into architecture to create a new way to experience a living urban space. 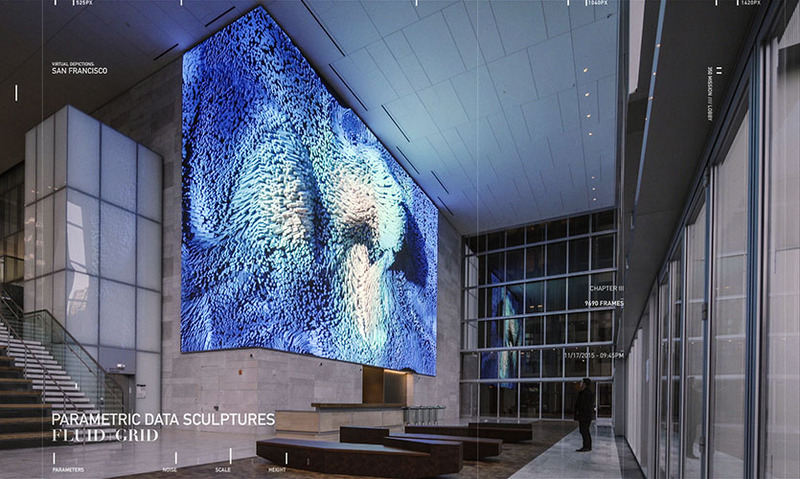 Anadol combined frozen data sets with contemporary architectural algorithms to create parametric sculptures that show how site-specific data sculpture can transform, create, expand and interpret existing urban spaces. He used publicly available frozen datasets at https://data.sfgov.org and Twitter's real-time API service. SF Data, a platform launched in 2009, contains hundreds of city datasets for use by developers, analysts, residents and more. 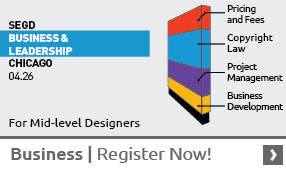 The City of San Francisco believes open data has the potential to support a range of outcomes, from increased quality of life to more efficient government services, better decisions and new businesses and services. Anadol also created a social network sculpture that transforms the virtual life of the city into a poetic digital sculpture. 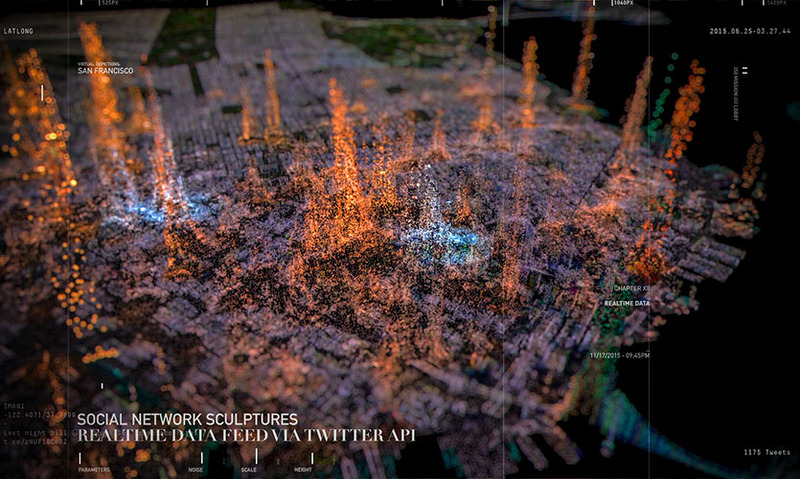 His team created a real-time data sculpture pipeline by combining geolocation-tagged Twitter activities and 3D point cloud data of the city. The result is an immersive and unique experience every single day fed by API. For this part of the project, Anadol collaborated with Schnellebuntebilder and Quadrature. 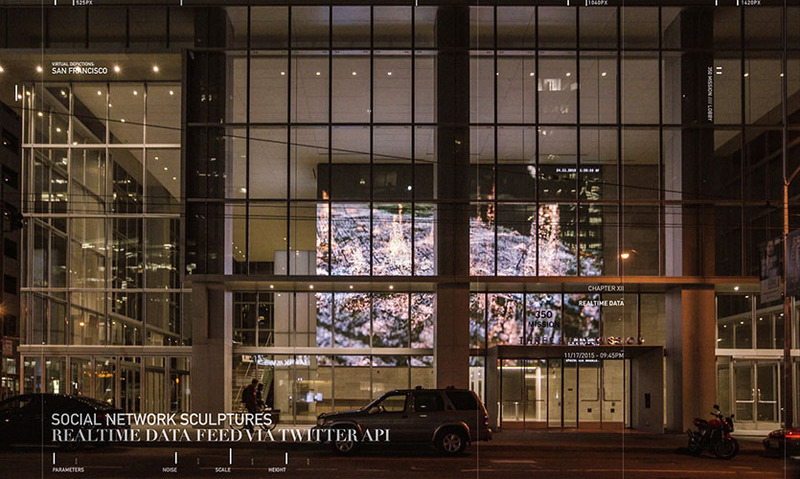 "Great to finally see digital that truly enhances a public space through interpretive art." "Our society is becoming more data-driven each and every day and Virtual Depictions brings that massive amount of data into an art form that people can relate to. The massive scale and movement of the experience activates not only the inside of the building, but outside at the street level as well." Kilroy Realty Corporation / John B. Kilroy Jr.